The Annual General Meeting of the Mayo International Choral Festival takes place on Tues 2nd April 8.30pm, Royal Hotel, Castlebar, Co. Mayo. All are welcome. The grand finale of the Mayo International Choral Festival was when all the choirs came together to sing The halleluja Chorus from Handel's Messiah and to raise the roof at the TF Royal theatre with hundreds of voices in perfect harmony. This was the rehearsal for the mass-sing. Photo: Alison laredo. The festival appeals to anyone who loves music. Choirs sing from a huge variety of genres and styles - from pop to jazz, barbershop to sacred music, gospel to classical - it's all in the mix! 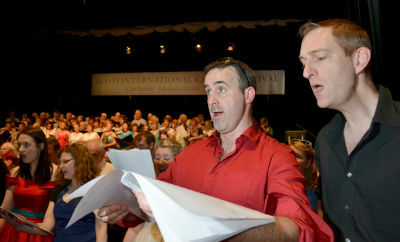 Expect to hear beautiful singing all over Mayo during May, when choirs rehearse and perform for the second Mayo International Choral Festival, 23rd - 26th May. Concerts take place on Thursday and Friday, each featuring one local and two visiting choirs in various Mayo venues. Choirs take the form of competing and non-competing, and this year will feature choirs from England, Germany, Scotland, USA and Wales, as well as many choirs from Ireland and Mayo. On Saturday the Gala Concert takes place in the Royal Theatre, Castlebar, when the majority of prize-winning choirs will perform.